After reviewing video footage collected for the 8-9 Volcano rockets recorded after the attack, I believe this is almost certainly the location of Volcano 4. The below clip shows a view to the west followed by a view to the east from two different videos. Combined with the GPS data, I think this proves a strong match to Volcano 4. 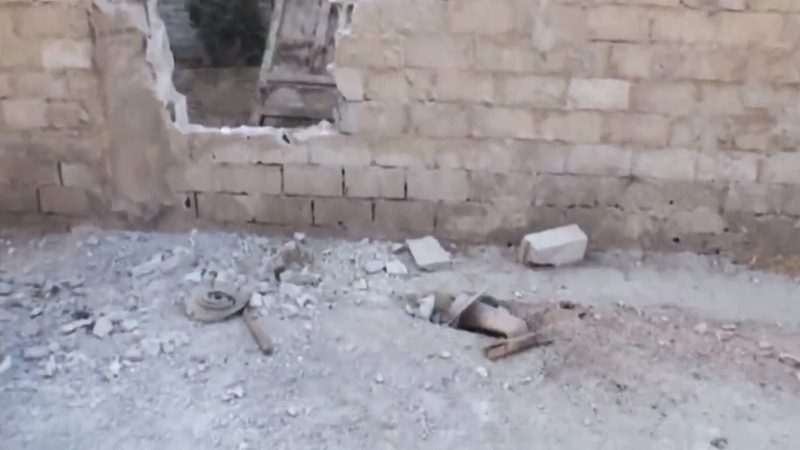 What's also very interesting about this video is it appears the munition passed through the wall to the north, landing just south-east of the hole in the wall. 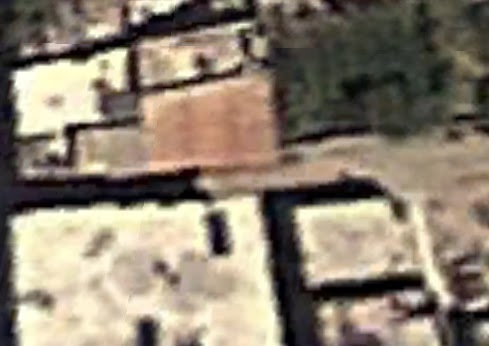 It's worth keeping in mind that just northwest of this position is a building that appears to be at least two storeys tall, so it's possible the munition could have deflected off the building. However, it does seem likely the rocket would have come from the northwest. 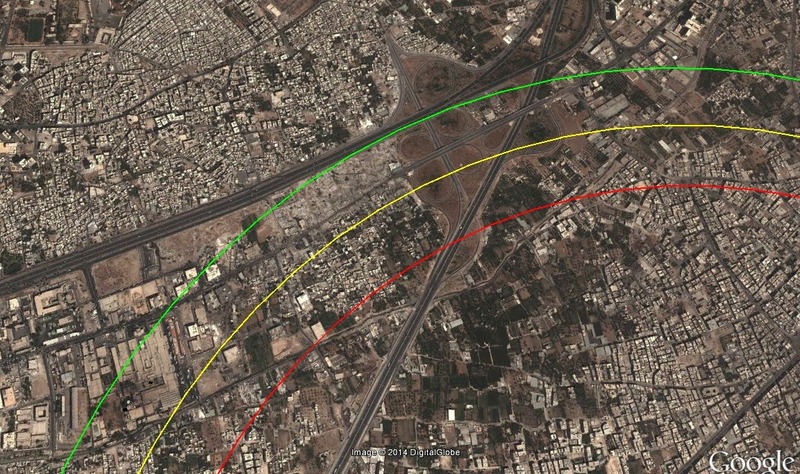 I've created the following map showing the distance from the impact site, with the red line being 2km, yellow being 2.25km, and green being 2.5km. It's worth noting the area south of the motorway running from the north to the west of the picture was the scene of Operaton al-Kabune, a government operation to secure a strip of land between Jobar and Qaboun, with the aim to encircle Jobar and Qaboun along the motorway running north to south in the above image. That operation commenced on August 20th 2013 as part of Operation Capital Shield. A big thank you to Chris Kabusk for help finding the impact locations of this rocket. 2. The haze, colors and atmosphere really look like morning and not evening to me. Don't you think? 3. This would mean we start by facing east, not west. 4. This also explains why the 20-30 blocks missing from the wall are not seen - they are on the other side. So my understanding is that the rocket came from NW, penetrated the ground, bent forward, split, and continued into the wall, breaking it. On the other side of the wall we should have the blocks and the main rocket body. Your identification of the building seems correct, and there's a matching wall to its east. 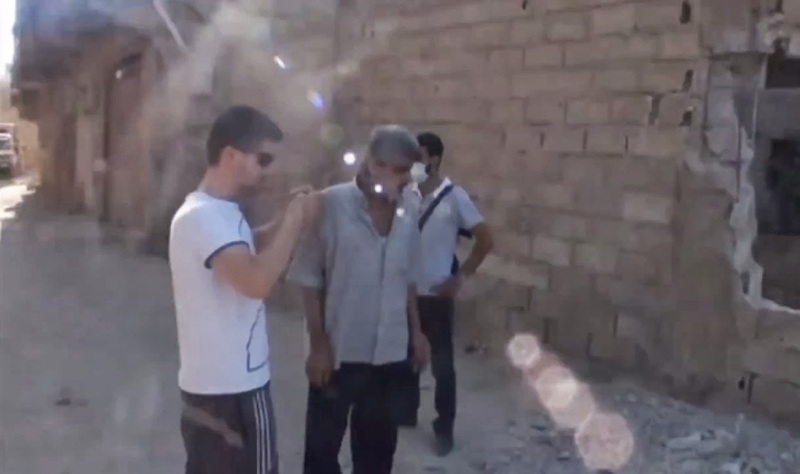 Could that be the impact site? I can ask the person who filmed it if he's the exact time. One thing to keep in mind it the scene seems pretty well travelled, and it looks like they removed the rocket section some point previously, so they could have moved a lot of the rubble out the way to to access it. I'll see if the person who filmed it can provide more information. 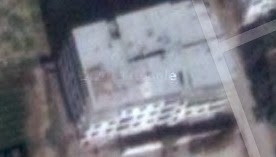 As for the specific site, it looks to me the impact site is very close to where the building on the north side, to the west, juts out over the lower floor, and it seems like they are stood in a position where there's a building to the south. It's possible the munition could have hit the building to the northwest, deployed, then carried on through the wall and into the ground, or that it deployed when it hit the wall. I've asked the person who filmed it to take a look at the area again, to check for damage to that building. I think those factors could effect what happened to the munition regarding bending when it finally hit the ground, so it's not as clear cut as the other example that was in the field. The problem is, there's a lot of differences between these impact sites, for example one hit bare earth, the other hit a far more solid looking surface while first passing through a wall, and maybe even hitting a building, so I think it would be potentially misleading to compare the end result too much. Hopefully the time and other pictures of the location will clear things up. Would be great if he can take a picture through the hole. Maybe something's still there. Currently I'm having trouble imagining how the rocket can penetrate the ground and then bend backwards. Just to be clear, based on video footage recorded after the attack you have identified 8 to 9 different Volcano rockets, correct? Do you have a map that shows the locations of all 4 of the impact sites you have identified so far? On a related note, where were the first 2 impact sites you said you have identified? I took a quick look back through the posts tagged "UMLACA", but didn't see any on the subject. Nice to see some new posts on the blog - I was wondering what was going on. Good luck with your new website! I would say the number is up to 8-10 impact sites and rockets. A couple only show partial remains, so it's unclear exactly how many there are. If you've got Google Earth I've created a kmz file showing the now 5 impact locations we've ID'd, as well as some of the locations the LCC identified to show those in relation to the possible ranges. I'm currently working on a project to review all the information related to August 21st, so that's why I'm finding all these new locations, and there's likely to be more to come. So you've ID'd an additional impact site since this blog post then? I had to do a Google search because I wasn't sure on what LCC and VDC were abbreviations for. Apparently they stand for Local Coordinating Committees and Center for Documentation of Violations in Syria respectively. 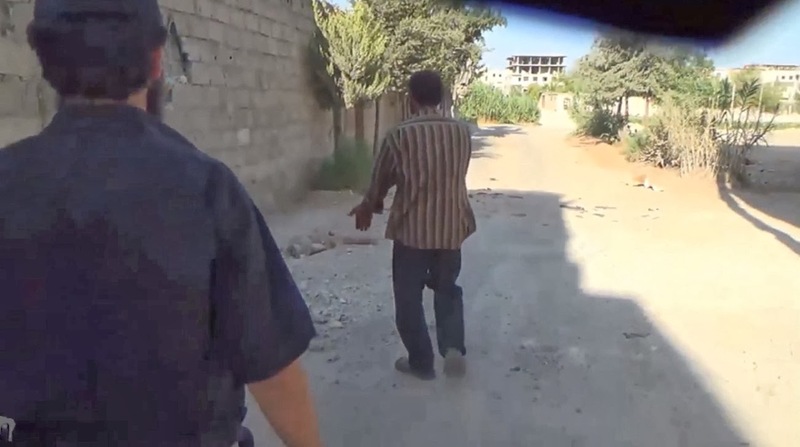 Are the locations they identified actual impact sites, or some other location related to the rocket attack? It seems like most of the impact sites you've ID'd so far are in open areas. Since I assume you're looking for actual craters or damage as rocket parts by themselves could have been moved, is it harder to find evidence in the built up areas? Has the information coming from this project reveal anything new, or just confirm what was already known? Finally, I just wanted to say excellent job. I know it sounds weird coming from some random guy on the Internet, but your posts are very informative. Consider yourself making history - not just for what you are doing, but also how you are doing it. The LCC and VDC positions are what they claim are impact sites, as per activists, so we're using geolocation to confirm those are correct. So far we've geolocated 5 impact sites, and 4 of those are marked on the VDC and LCC maps, although the VDC and LCC locations aren't always an exact match. That could be down to the nearest landmark being used to describe the impact location. All three sets of impact locations do fall within the same area though. 4 of the impact locations show the munition remains embedded in the ground, or in a difficult to reach location, where the 5th on is less certain as there's only a few scraps and a crater. The biggest challange is matching the videos we've not geolocated to impact locations, although we've probably only got 2-3 left that would be geolocatable. 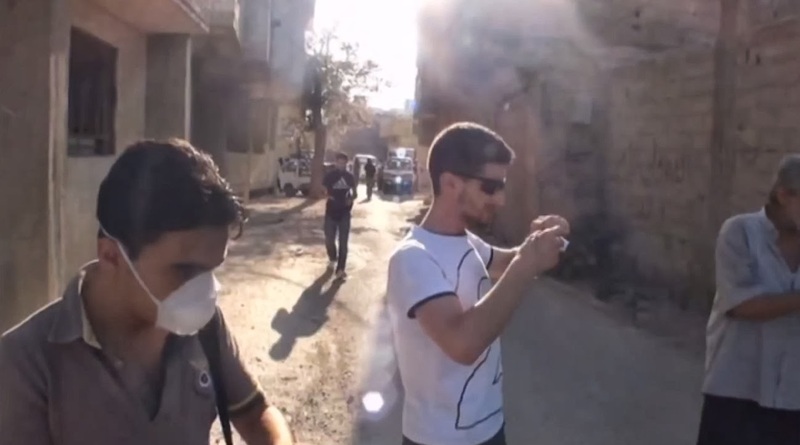 The useful thing about the project is we've been able geolocate more impact locations, and start collecting other relevant information, like details of Operation al-Kabune and Operation Capital Shield, both of give a lot of context to the attacks, and are make it clear the attacks weren't just some random act. 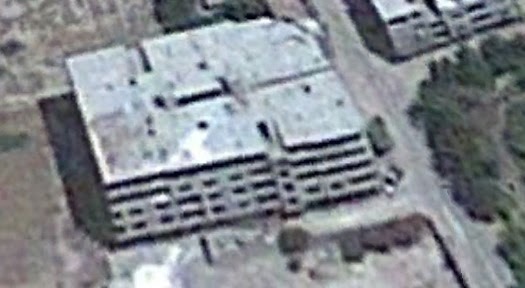 Currently I'm reviewing all the videos posted from Jobar and Qaboun before and after August 21st, and mapping them out on Google Earth, so we have as much information on the situation on the ground before and after the attack. A side effect of this is myself and others have been very focused on the Facebook pages of those groups in Eastern Ghouta that have now been deleted, so we're hopefully going to get those restored.